Sprinkler is a necessity on gardens, because it will definitely reduce your time and task consumed in maintaining a garden at your home. Having a garden is no easy task. When you have already created your dream garden, the work does not stop there. You still have to maintain your garden to allow it to thrive and prosper. There are many things needed in order to maintain a garden in its top condition. The most basic and important need of every garden is water. Water is very important because all the plants depend on water to survive. As basic as it may seem, maintaining adequate hydration to the plants in a garden is no walk in the park. The hardest part of the hydration process is the time. Technically, you can get by without it, but if you have a relatively large garden or a lot of plants or limited time to spend watering your garden every day, having a sprinkler can be a great thing. There are basic sprinklers that don’t cost a lot and there are very advanced models that have timers, water monitors, adjustable spray patterns, and other features. A basic one is a good investment for a small garden. If you have a large garden or if you have plants that require different amounts of water then installing it with adjustable spray patterns can be a real time and water saver. 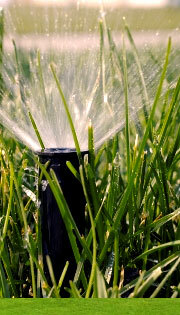 Most garden owners use the conventional sprinkler system. It is a system that relies solely on the pressure from the water supply to propel the unit. This conventional one is a much simple and does not require a lot of set-up to use. Though it can still water your garden there are several disadvantage of using such set-up. Since the unit relies solely on the pressure from the water source, when there are times that the pressure is low, so does the unit’s performance. With low pressure, this means that the range of water will be only a few feet in diameter. Another disadvantage of this set-up is that since the nozzles are placed on fix angles the area that is being watered constantly the same each time which will only be corrected with the moving of the unit in other area. Also the fix angle nozzle will cause it to miss out a lot of areas in the garden. To solve the problem we use the combination of technology with the system. Newer versions are connected with the computer to create a more efficient way to maintain your garden. Unlike your conventional unit that relies on the pressure of the water source. The automated sprinkler system is using a water pump to ensure that the pressure remains constant all throughout the hydration process. Having a constant and steady pressure is not the only advantage of this sytem. Another very good feature of the automated sprinkler system is the movable nozzle that changes angle during hydration to ensure that all the surfaces of the garden is hydrated adequately. I know what you might be thinking and I am sure that you are thinking that a set-up like this will cost you a lot. Well, that is true. The cost is quite much but it does save you a lot as well. Not only do you save time but also the water being consumed. It can be programmed to deliver a specific amount of volume of water at a specific time. They are just some of the must-haves in maintaining a healthy and green garden. This saves you time and money therefore still it is a worthy investment.